Sit at home order was IPOB directive alone not anything to do with criminal MASSOB that was against it. Uchenna Madu, you were quick to ride on the back of IPOB to take credit for a successful sit at home order but in your exchange with me CHINASA NWORU and as confirmed by the video of your event, you didn't observe 30th of May sit-at-home directive. You were against it, citing differences in ideology. Let this be the first and the last time you will attach yourself to IPOB success to take glory. IPOB is not MASSOB because we are not double agents or betrayers. After the Nigerian Army shot and killed so many of us at Nkpor in 2016, you went to Ghana and made a statement that your group is not part of IPOB. When you returned from Ghana you shamelessly traveled to Sokoto to meet the Sultan with your fellow hungry MASSOB agitators where some chicken change was given to you by the caliphate. Your politician godfathers are Senator Andy Ubah and Chief Ezeonwuka (Ogirishi Igbo) both of whom have no credibility. Despite all these your shortcomings, our leader allowed you to visit him when he came out of prison. In your speech in his house you said you will be loyal to him along with other mushroom groups that went with you. Today you are giving a counter order and working with Ikedife in your empty coalition to undermine the leader you said you will be loyal to. Senator Andy Ubah may have purchased you airtime on Channels TV to claim credit for a sit at home order you countered but we are alive to your tricks. 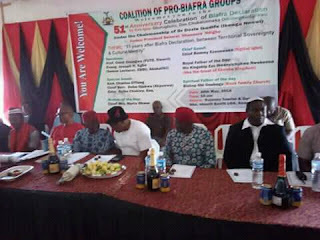 You attended Ohaneze Ndigbo Awka summit against an order from the DOS of IPOB. Your new partner in crime Rita Anigbogu was there pointing out IPOB family members for the Zoo police to arrest. You took a paltry 800,000 Naira from Nnia Nwodo’s Ohaneze to bus Biafrans in to defend them. Your cup is full. One more missed step from you and you are a goner like the rest. At IPOB we are clean and transparent. You cannot eat your cake and have it. I will make sure you never get close to our leader Mazi Nnamdi Kanu ever again. You are not a freedom fighter and can never be part of IPOB. We don't like double agents and liars. Below is Uchenna Madu at Rogenny Games Village Oba with the criminal head of double agents in Biafraland Dr. Ikedife during our May 30th sit-at-home. Both Uchenna Madu's faction of MASSOB and Ikedife's MOBIN did not observe sit at home but they want to claim credit. Traitors, woe unto you people.